I bought some green mango hoping to make Malaysian mango sambal, but found out it has already gone semi ripen with a slight sweetness but still hard. Not sour enough to make sambal so decided to make Thai mango salad. I don't mind shredding the mango because I have a much loved gadget i.e. 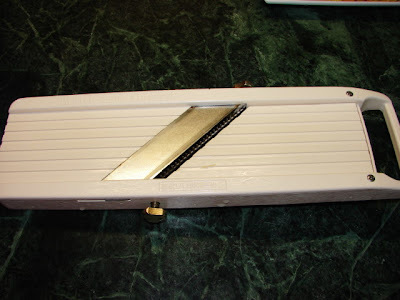 this Japanese mandoline I had for over 10 years. Shredding vegetable is child play. Thai style mango salad is lovely and refreshing. Green mango is nice so is semi ripe mango but must remain very firm. 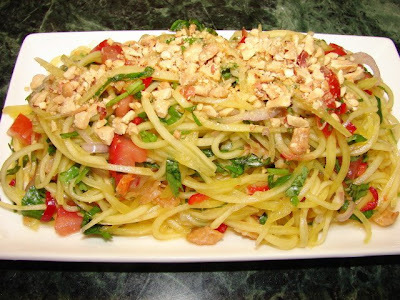 This salad is similar to green papaya salad. Here is what I usually do. Slice shallot very thin. Chop chilli. Rinse and soak dried shrimps for few minutes then chop. Mix this together with lime juice, fish sauce and palm sugar for about 10 - 15 minutes. Shallots taste better after marinated with lime juice. Roughly chopped tomato add this to shallot mixture. Shred mango. Chop coriander and shred mint. Mix this with the other ingredients above. Plate up and sprinkle on crushed peanuts. For a change, sometime I will use half mango half mooli which is also very nice. If you like to make this salad suitable for vegan, use fish sauce substitute like a very light soy sauce and leave out dried shrimps. I didn't know you could use a bog-standard supermarket uripe mango for this kind of salad, I thought there was a special type of mango to use. This opens up a whole world of salads! Supermarket mango is fine as long as it is rock hard. Those green mango from Chinatown is expensive.